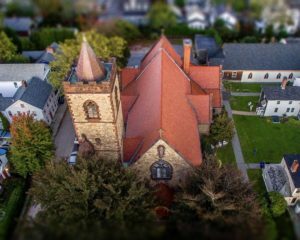 Place : Zabriskie Memorial Church of Saint John the Evangelist, 61 Washington St., Newport, RI (Corner of Washington & Willow streets). Free parking in church lot, opposite 25 Willow St. Please join us on Sunday, Nov. 11, for a Candlelight Concert of Remembrance in observance of the 100th anniversary of Armistice Day. 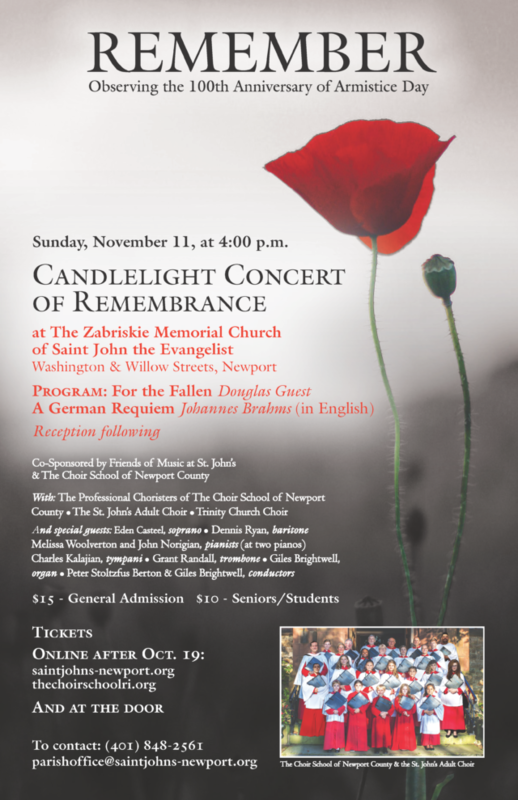 Program includes For the Fallen by Douglas Guest and A German Requiem by Johannes Brahms (in English). Featuring the Professional Choristers of The Choir School of Newport County, the St. John’s Adult Choir and the Trinity Church Choir, with special guests Eden Casteel, soprano; Dennis Ryan, baritone; Melissa Woolverton and John Norigian, pianists (at two pianos); Charles Kalajian, tympani; Grant Randall, trombone; Giles Brightwell, organ; and Peter Stoltzfus Berton & Giles Brightwell, conductors. Reception following. Co-sponsored by the Friends of Music at St. John’s and The Choir School of Newport County. Tickets: $15 General Admission, $10 Students/Seniors.